The transition to more environmentally safe chlorofluorocarbon refrigerants for commercial chillers will cause a cooling dilemma for many building owners. This is due to the fact that chiller conversions will experience a loss in cooling capacity, an efficiency drop that can approach 15%. With these environmental regulations, building owners will be faced with a tough problem - how to maintain cooling comfort for tenants with less chiller capacity. Building owners and managers will either have to run the chiller for longer hours if capacity permits, or buy an additional chiller unit. However, a better solution for building owners and managers is to retrofit the facility with 3M window film. Because 3M window films cut heat gain from 19% to 76%, the chiller's capacity loss can be offset. An application of 3M window film may allow the building owner to maintain the level of cooling comfort for tenants without adding expensive cooling capacity or increasing annual energy costs from additional chiller run time. The 3M solution to the chiller capacity crunch has other benefits as well. 3M window films also cut glare, add safety and security to glass, and can make the building more attractive by unifying its external appearance. 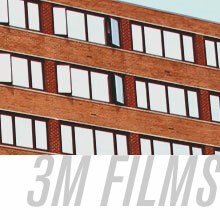 3M window film is a good answer to environmental concerns.